With over 1500 acres in cultivate, John Gill, of Gill Farms, is certainly feeding us - and his main crop is sweet corn, 16 million lbs a year. Gill’s corn can be found in Canada, Puerto Rico, Spain - and Bard College, via Hyland’s Winter Sun Farms. Gill’s system for harvesting and processing sweet corn has been perfected over many years. He purchases his seeds via a variety of avenues; his one stipulation being that it be free from genetic engineering. 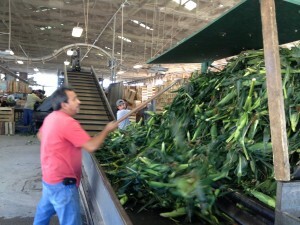 The corn is picked by a machine and within 90 minutes has been sorted, packed in recycled boxes (6 rows deep by 8 rows wide), and placed in a machine that takes 45 minutes to wash and cool the ears to 38 degrees.Corn has such high levels of starch that the ear can combust if it is not cooled quickly enough. As such, Gill has a large cold room where the boxes can await transport on large trucks. The corn is stacked and then 2000-3000 lbs of ice is sprayed over the top to keep the husk wet and green during transport. As I munch on my first ever ear of freshly picked raw sweet corn, Gill shares information about the specific geology of the region. The Esopus Creek runs right through the center of the valley and basically this whole valley was a flood plain. It flooded and receded for millions of years – it left us with topsoil. The topsoil is anywhere from 10 to 30 feet deep – throughout the whole valley without any stones. So we are really fortunate. Now the drawback is that in the last 10 years we’ve had some really bad flooding. Consequently, we’ve lost about 30 acres of farmland – that we can never farm again. It has just ripped it so bad, it took all the topsoil away. Other than that – the creek is like heaven and hell at the same time. From the water, to the topsoil, to the corn, to our bellies.